Apple might have to wait longer before it brings Apple Pay to India, but Indians won’t. Bengaluru-based iKaaz Software, a mobile payment solution provider, is set to launch a new application called MOWA, which will take mobile wallets to the next level where users don’t need to load cash in their virtual wallets. Until now, one had to transfer money from one’s credit card or bank account through net banking to fill the mobile wallet before one can proceed with a transaction. However, MOWA operates as an ‘open wallet’. Here, users will have to link their credit cards or debit cards to the MOWA wallet. “The money will only be transferred as and when a transaction happens following multi-level authentication by the user and security checks. The advantage here is that the money is not blocked or kept in the wallet unnecessarily. It stays in the user’s bank account or credit card,” says iKaaz Software’s CEO Soma Sundaram, a former Nokia Money team member. iKaaz is launching the new mobile payment solution in partnership with DCB Bank. iKaaz will be providing the technology solutions, while DCB Bank will be the payment facilitator. Being a full-fledged bank, DCB has the required licences from the Reserve Bank of India (RBI). “No, we did not need to have a licence for this,” says Sundaram. Here’s how MOWA works: After registering, a user will need to link his credit card or debit card with the wallet. He will then have to select contacts, who could be a friend or a merchant and specify the details. Once the user wants to make a transaction, there will be multi-level authentication and security checks to complete the payment, which could be bills, recharge of pre-paid services, payment to retailers across India, etc. Users can also send money to friends or family. However, the amount of transaction is restricted to Rs 10,000 a day, and the cumulative value of all transactions in a month is Rs 1 lakh, as per RBI guidelines. 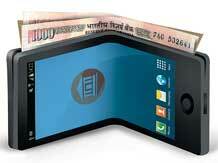 Sundaram says it is like a “tap-and-pay” mechanism on mobile phones. “Small merchants don’t have cashless payment facilities, and it might not be feasible for them to introduce cashless payments if it’s something like a kirana store. MOWA solves the problem as they can now use their mobile devices as point-of-sale (POS) terminals for digital payments,” he adds. Through MOWA, payments can be made by using the receiver’s mobile number, and there’s no need to have bank account details, Sundaram notes. While the app will be offered free initially, merchants will have to pay a processing fee of 1.5 per cent of the value of each transaction at a later stage. For normal users, MOWA will always be free. The solution will work on near-field communication, or NFC, technology that enables a smartphone to send information to another by taping the devices. The company already has about 7,500 merchants, including hotels, restaurants, kirana stores and telecom stores which accept cashless payments through iKaaz’s NFC cards. These entities could easily adopt MOWA. The company also operates in Nigeria in partnership with First City Monument Bank.